We’ve all got it and likely too much of it. I like a clean house. I like to not have to dig and search for things. I absolutely HATE to lose something. It keeps me awake at night. Weird, right? All of these things started happening in our house this Winter. It was getting cluttered and I was just so over it! 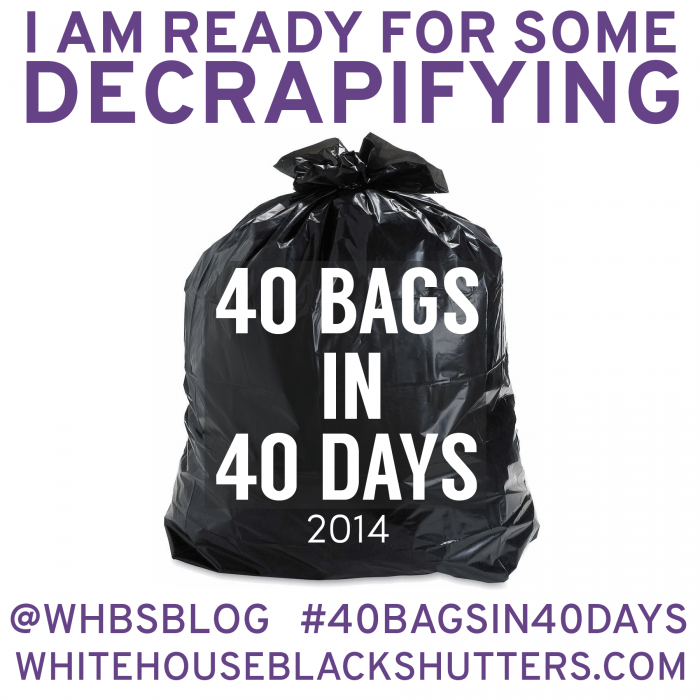 Then I found the 40 Bags in 40 Days Challenge over at the White House Black Shutters blog. This kind of challenge just makes me HAPPY!! I made the challenge my Lenten goal and went with it. The general idea is to get rid of STUFF. Ann Marie at WHBS even made printables to make the challenge more organized. I like the way she thinks 😉 You can be as strict or as loose as you want. 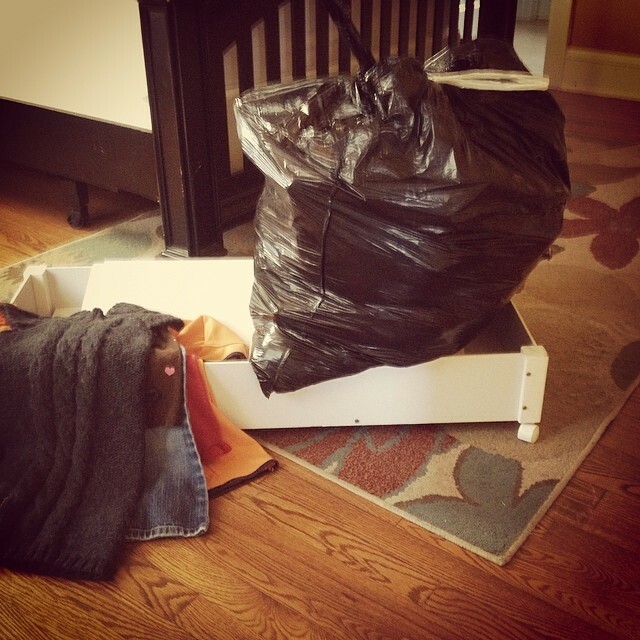 I used large black trash bags for my “bag a day”. Although, if you wanted you could use a grocery bag. Or even count a large item as a “bag”. The idea is to purge the house and make life easier. In a perfect world I’d be a minimalist. I like clean surfaces and tidy rooms. But I also have a husband and three kids who don’t share the same ideas 😉 That’s okay though, middle ground is important! 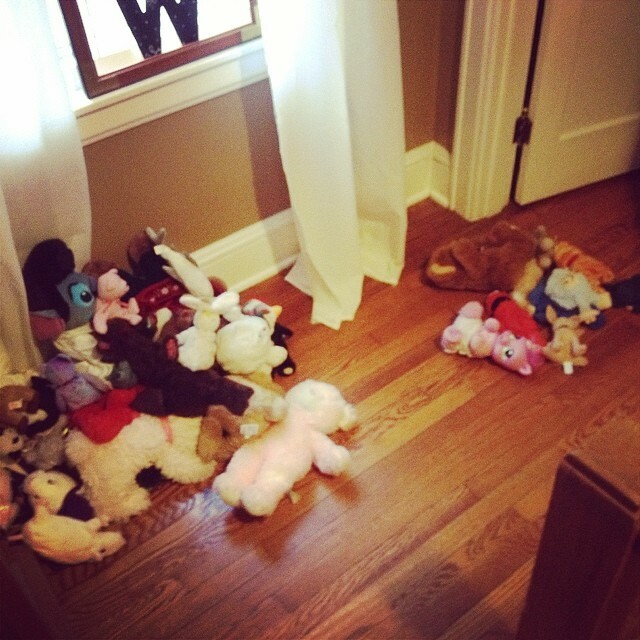 The dreaded stuffed animal purge. Guess which pile is keep and which is giveaway? Ugh. I finished the challenge with only 25 bags gone but I went through every room, every drawer, every cabinet. I tried to focus on one spot per day, but as life happens, that wasn’t always the case. Some days I went crazy and got a lot more than my goal done and some days I got nothing done. That’s okay too! It feels great to be more organized and if I’m being honest, more in control. Of course, you can take up the challenge anytime, not just during Lent. What are you waiting for? Do you have too much stuff? Is it making your life stressed? Or are you more awesome than me and staying on top of it all? Be sure to hop over to WHBS for all of the details!